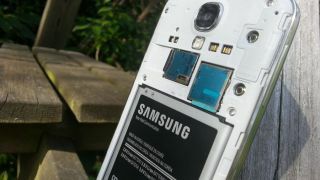 Mobile phone batteries: room for improvement. Would you trade in a bit of your smartphone's lightness and thinness in return for some extra battery life? Oukitel thinks you will if prototype images spotted on the web are anything to go by. The Chinese manufacturer is said to be working on a phone that sports a whopping 10,000mAh battery. The indications are that you could go a whole week between charges with this beast. These leaked pictures are all we have to go on for now - included in the title of the post is "Android 5.1" so it sounds like Google's most recent mobile OS is going to be part of the picture. Judging by these pictures the new Oukitel phone is very much a work in progress and there's no official confirmation from the company yet. It would be nice to at least have the option of a bulkier, longer-lasting handset. The chunky black slab is slightly reminiscent of the Samsung Galaxy S6 Active but it's difficult to make out any distinctive features. Chinese outfits ZTE and Gionee have also been experimenting with bulkier battery packs. Even if the phone does exist, it's unlikely to ever make it out of Asia - but if it sells in decent quantities then the likes of Apple, Samsung, Google and the rest are sure to sit up and take notice.